Border United Breweries, Beechworth & Albury. A short-lived company from the Victorian-New South Wales Border. The company was formed in March 1911 to purchase the assets of the Anglo-Australian Brewery Company (Beechworth, Tallangatta and Yarrawonga) and the Albury Brewing & Malting Co (Albury). The plan was to create a much larger operation with the scale to take on the city breweries, in particular Carlton and United. However the plan failed when not enough co-operative shares could be sold and the company succumbed in August 1914 eventually to be bought out by a new consortium that created Murray Breweries. 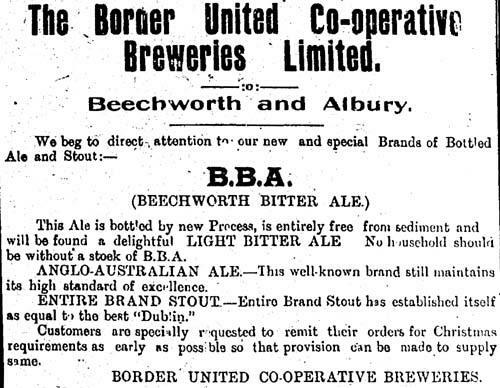 For a fuller history see the "Border United Co-Operative Breweries Ltd Beechworth, Albury, Tallangatta, Yarrawonga" thread in the Articles section on the Australian Bottle Forum.